Concerts & Tours | Welcome - Light Action Inc. Using our extensive inventory of state of the art speakers, wireless microphones and digital mixing consoles, we can provide high quality audio for any concert or tour. Our engineers have extensive broadcast and concert backgrounds, ensuring a complete package of reliable performance sound. 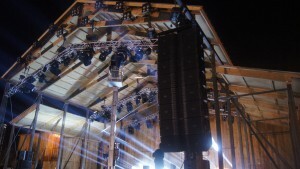 Through testing, wiring and mixing, we will design and install the appropriately sized sound system for both your audience and venue.